The Paasche R-75 compressor regulator is an in-line low pressure regulator with a 60 p.s.i. gauge and moisture drain. 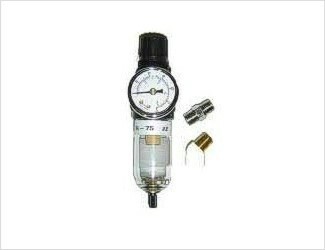 This regulator gives user control of operating pressure as well as assisting in furnishing clean, dry and regulated air. Regulators must only be used as instructions and warnings specify. Five (5) micron filtration, 15 SCFM @ 50 p.s.i. CAUTION:R-75 is not for use on LCT Tanks.